Conducted under Robert’s Rules of Order. Persons wishing to speak must sign up before the meeting. (2 minute time limit). Speakers will be recognized and come to the microphone to be heard. The session is intended to be a positive sharing of knowledge. Although many may want to share their experience, negativity and excessive criticism will be discouraged. Objective/Output: Develop a list of recommendations to government for actions to be taken. An overview of Trooper activities in Meadow Lakes and suggested action for combating property crime. 7:30 Review of SB 54: Palmer District Attorney’s Office. Prosecutor’s perspective on crime in the Valley; prosecutor resources; overview of SB 54. A review of Borough options for assisting community crime prevention. Representatives from the Business Community and local organizations. 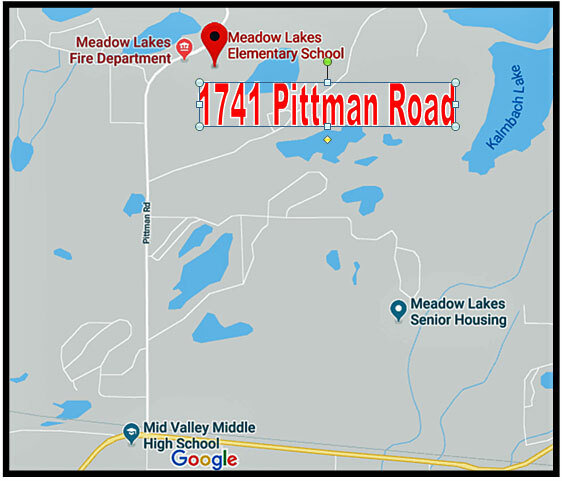 Location: The proposed marijuana cultivation facility is located at 6570 W. Trevett Circle, (Tax ID# 17N02W10A015); within Township 17 North, Range 2 West, Section 10, Seward Meridian. Comments are due on or before February 23, 2018 and will be included in the Planning Commission packet for the Commissioner’s review and information. Please be advised that comments received from the public after that date will not be included in the staff report to the Planning Commission. Thank you for your review. Oversees the subdivision of land within the Borough. As per Title 43 Subdivisions, at 43.20.060 Dedication To Public (D), the petitioner will need to dedicate a ROW connecting through to W. Powder Road to improve future interconnectivity and safety of the public. 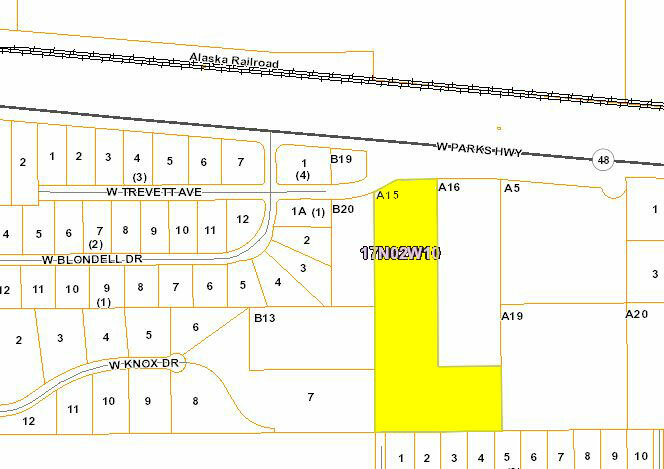 The request is to divide Tax Parcel A12 (Government Lot 1) into 3 tracts to be known as Klinefelt Subdivision, containing 36.88 acres more or less. The petitioner also requests to create a public use easement within Tax Parcel D1 from W. Floyd's Place to provide access to the proposed tracts. Located within the NE% Section 29 & the SEA Section 20, Township 18 North, Range 2 West, Seward Meridian Alaska, adjoining the northeast corner of Visnaw Lake, lying west of N. Coronado St. 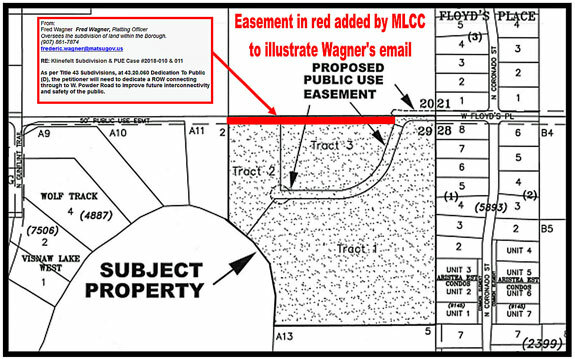 Please submit your comments in writing, specifying any easements or other requirements that your department or agency may need or any data which you feel should be incorporated on the preliminary plat to help us more effectively enforce our subdivision regulations. All comments, existing files and correspondence that you may have relating to this case must be submitted to the Platting Division by February 9, 2018 so that we may incorporate this information into our recommendations to the Platting Board, for the public hearing to be held on March 1, 2018. Providing Outstanding Borough Services to the Matanuska-Susitna Community.